What is White Jelly Mushroom Extract? As a dietary supplement, take 1000mg of White Jelly Mushroom Extract once daily. Nootropics Depot offers 30g or 60g jars of certified organic White Jelly Whole Fruiting Body Mushroom Extract. Nootropics Depot's White Jelly mushroom extract powder has been lab-tested and verified for both product purity and identity. 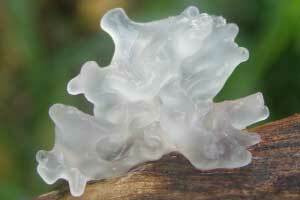 To learn more, read the White Jelly mushroom reviews and experiences below. Great skin purifier and beautifier. I live by the beach, and so I am always putting on lotion and creams, but this stuff seems to soften from the inside out. Good product, vibrant skin. Highly recommended. I’ve been taking the Tremella as well as Chaga and Turkey tail, I put them in my smoothies and I’ve been getting a lot of compliments on my skin-so I will definitely continue ordering them! We are using this product in skin care - so far it is performing very well. We are so happy to be able to use quality whole-food ingredients. Thank you. Taken as directed, I found this to be good for soft, smooth skin. Very fluffy, so takes a minute to mix in water. Less pungent than other mushrooms. Very innocuous, low flavor. Pure quality as always. After reading the description I decided to try them out. I will usually take them at night, 1 gram, and mix them with bowl of strawberry banana yogurt w/ hemp granola, or something similar in nature, sometimes in my morning tea. I take a couple of other mushroom extracts with this, so it's hard to pinpoint the exact effects of this mushroom. I don't know if it's from this mushroom, or a culmination of the other two, (Cordyceps and Turkey Tail) but from the statement about clearing up freckles, I'd assume it has effects on the skin, and I have noticed my skin is the softest it has ever been, and that's without using any lotions or anything hygiene wise. Also, over the time I've been taking it that as others around me have gotten sick, and taken day's to weeks to get better, I find that I'll still got their symptoms, but I usually felt back to my normal self the next morning, while they continued to suffer and teased me about my weird crazy diet. As it stands now, I'm certainly going to keep with this mushroom to study its effects further. Great quality, and speedy shipping as usual. I've never had orders come in a day earlier that projected, but it's consistent with Nootropicsdepot, which is awesome! I love it! The name suits it. I use this product to help boost my immune system since I have read good things about it. I definitely get sick a lot less when taking it. It's also very jelly like when you put it in your mouth. It has a very unique texture. I recommend trying it out.